For many years I have been lecturing on the history of Tarot and divination cards at the Metropolitan Museum of Art in New York. My lectures take place in the print collection, a library of historic prints nestled behind the walls of the print gallery in the museum. Although I do expound on the history of cards, the afternoon is actually more of a guided tour of the museum’s collection of playing and divinatory cards. The collection includes what may be the oldest woodcut printed Tarot cards in the world, and contains examples of cards from every period from the 15th century to the present. Although most of my students are probably drawn here by the chance to see early Tarots, when we get to the 19th century examples, oracle cards (non-Tarot decks intended primarily for use in divination) dominate the collection. Naturally, after seeing these decks for several years and realizing that there was little information available on them, I had a desire to uncover their history. Simultaneously the idea of designing my own oracle deck began to emerge. So, when Rachel Pollack approached me with the offer of collaborating on an oracle deck I was not only open to the suggestion, I was eager to start. As Rachel states in her Burning Serpent Oracle book, we did not begin this project with the intention of creating a Lenormand deck but this is the tradition to which The Burning Serpent belongs. It is as if the Lenormand cards reached out to us unconsciously, and at a certain point in the process we became conscious of this direction and began to intentionally create a Lenormand. The Lenornand cards are a type of oracle deck that originated in 19th century Europe, and that has remained popular there. In America and England, however, it was unknown or overlooked until recently, when it has become almost an obsession with a growing group of card readers, many of whom also read the Tarot. 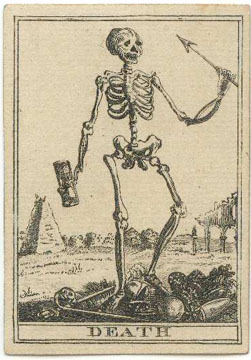 The Lenormand deck tends to be minimalistic, with cards depicting, for example, a ring, a scythe, or a book, and it tends to apply definite meanings to these images, such as commitment for the ring, danger for the scythe, and secrets for the book. This limitation is useful when the cards are used for divination, and I apply similar basic meanings to the cards when I work with the Tarot. However, I also look into the images in the Tarot for deeper spiritual guidance, and I noticed that many non-Lenormand oracle decks have similar spiritual or mythic dimensions. It was my intention and Rachel’s to create a Lenormand with this spiritual dimension and I am writing this history to provide insight into my inspiration for our deck. At first, all I knew about the Lenormand came from a brief mention in A Wicked Pack of Cards by Ronald Decker, Thierry Depaulis, and Michael Dummett, who pointed out that the Lenormand deck was based on an earlier deck used for a game. Much of the history of the deck beyond this connection has only been uncovered recently, thanks to the efforts and discoveries of Marcus Katz and Tali Goodwin, the authors of Learning Lenormand, and Tarot scholar Mary K. Greer, who has found a previously unknown early source for the Lenormand images. This article is intended to add to the work that they started. I intend to unveil an even earlier source, one that is a common ancestor for both the Lenormand and all other oracle decks. 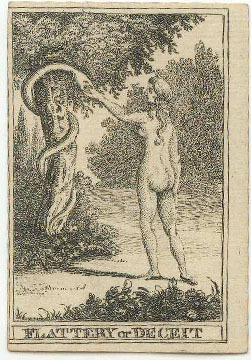 I have also found that many of the images that I created for The Burning Serpent Oracle, although they emerged totally from my imagination and my discussions with Rachel, have an uncanny resonance with this early deck. Marie Anne Adelaide Le Normand (1772-1843) was born in Normandy but moved to Paris in 1786. She also lived in Belgium and London for short periods. She became the most famous fortuneteller in Europe during the Napoleonic era. 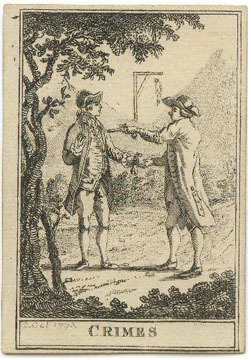 Le Normand used a variety of divinatory methods, including palmistry, numerology, scrying, necromancy, 33 Greek sticks, a magic wand, and a special talisman. She also read egg whites and coffee grounds. 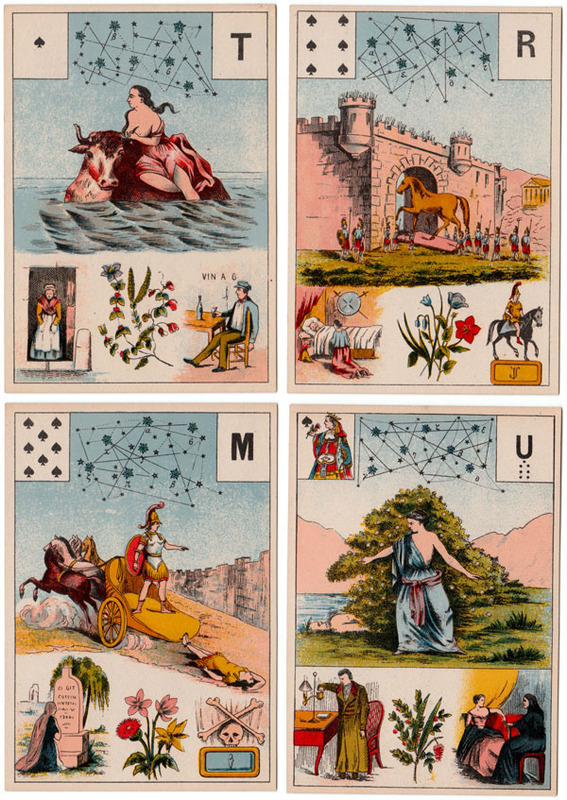 For cartomancy, she used an ordinary pack of 32 French Piquet cards and a German 36-card deck. 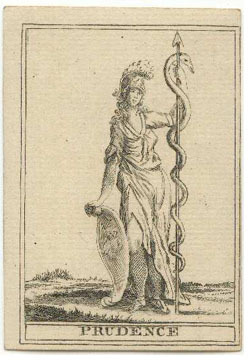 In addition, she is said to have been an admirer of the French occultist Etteilla and may have used the Tarot that he designed, The Grand Etteilla, as well as a traditional French Tarot. The French and German decks seem to have influenced the later Lenormand decks and it is useful to know more about their structure. 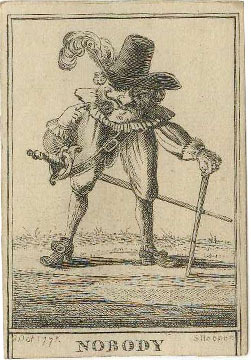 Pique decks have the four French suits: hearts, clubs, diamonds, and spades, but only contain the knave, queen, king, ace, and the pips numbered seven to ten in each suit. 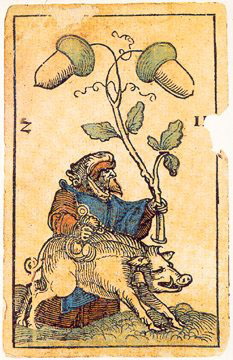 The traditional German 36-card deck is used mainly in Bavaria for playing games like Schafkopf (sheep’s head). 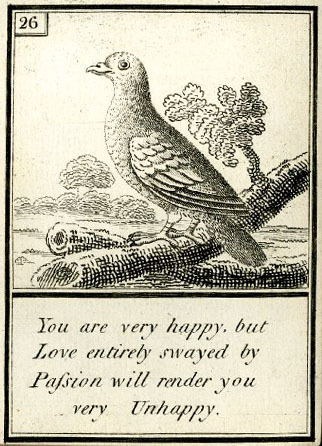 It has four suits of: hearts, acorns, hawk belles, and leaves, each with an under knave, over knave, king, ace (the ace displays two suit symbols and is sometimes considered a duce), and the six to ten pips. There are also German decks that use the French suit symbols, and a deck that combines the French symbols with the German colors: red hearts, yellow diamonds, green spades, and black clubs. Mlle. Le Normand’s fame rests on the fact that she was the author of 14 best selling books, in which she described her career and her dealings with her famous clients. Her clients included Marat, Robespierre, Czar Alexander, and most famously the Empress Josephine. 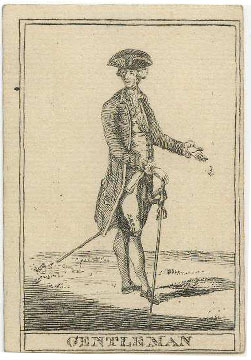 Le Normand is credited with predicting the rise and the fall of Napoleon. In fame, she is comparable to the 20th century psychic Jeane Dixon (1904-1997), who was famous for having predicted the assassination of President Kennedy. Many of Mlle. 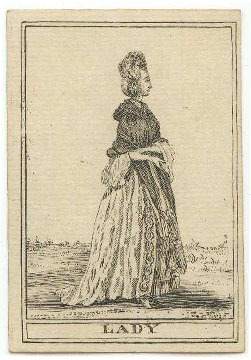 Le Normand’s statements about her life and her dealings with high society have been shown to be exaggerated or simply false. However, it is true that she was a member of a secret society in London, called Members of Mercurii. In 1845, two years after her death, Mlle. 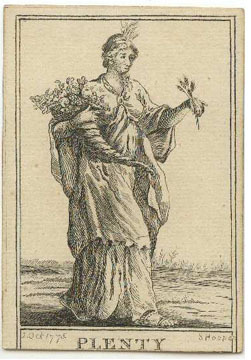 Le Normand’s name was attached to a set of divination or cartomancy cards, Grand jeu de Mlle Lenormand, published in France by Grimaud. 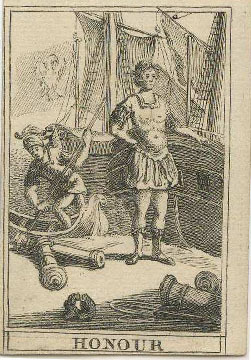 The colorful deck was one of the first examples of lithographic printing in France. It consisted of 52 cards related to an ordinary playing card deck, with two additional cards (significators) representing a male or a female querent, 54 cards in total. Each card depicted a central scene surrounded by symbols: a miniature playing card, a bold letter, a constellation, and a flower. It was sold with a set of five books describing various types of divination, including cartomancy, palmistry, astrology, numerology, and talismans. 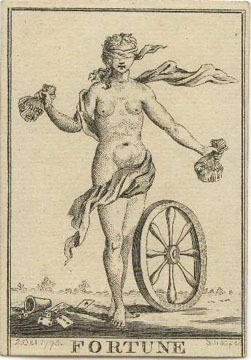 In 1846, Mlle Le Normand’s name was applied to another oracle deck, Petit Le Normand, published in Germany. 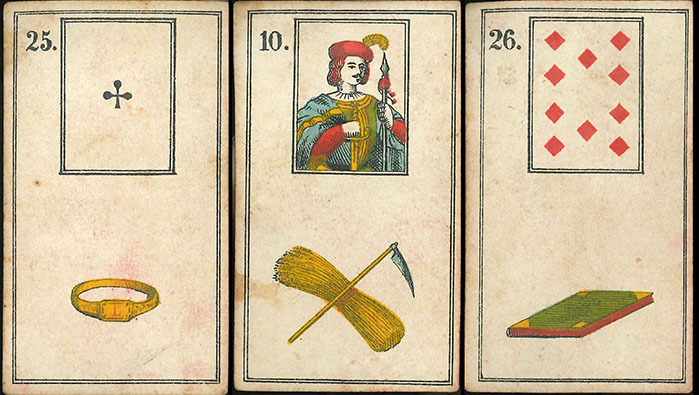 The German deck consisted of 36 cards, which had little in common with the French Lenormand. Each card depicted an iconic symbol, such as a ring, a ship, a house, a dog, or a heart, all with a miniature playing card at the top. 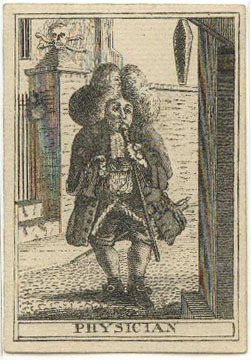 Although it contained 36 cards like a German deck, the miniature playing cards on the face displayed the French suit symbols. Neither of these decks had been used by Mlle. 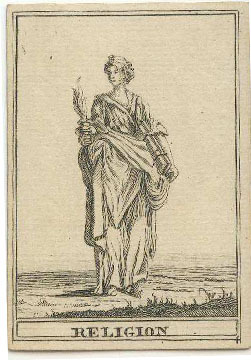 Le Normand and her name was attached only so that the publishers could cash in on her fame. Similarly, several spurious biographies of Mlle. 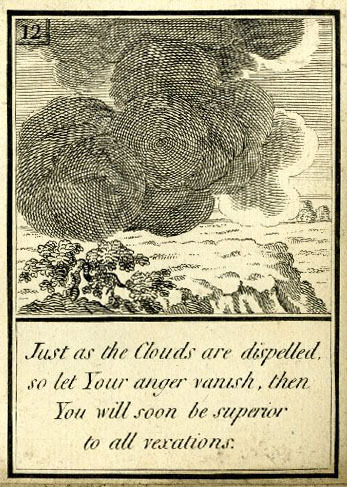 Le Normand and a book claiming to contain her last predictions were published soon after her death. There seems to have been earlier divination decks that may have influenced the Lenormand. 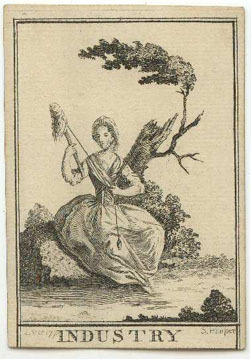 By 1818, 36-card fortune telling decks were being created in Germany and Austria in which iconic images related to some of the Le Normand images were correlated with German suits. 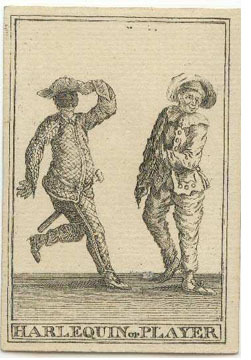 These decks seem to have influenced the Petit Le Normand, and are related to sibilla cards that were created in Italy, France, Germany, Austria, and Hungary since the 1700s but do not display numbers or suit symbols. 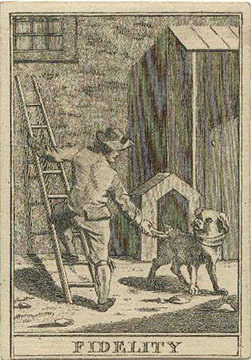 Another offshoot, the Kipper Cards, was created in Bavaria, circa 1870. 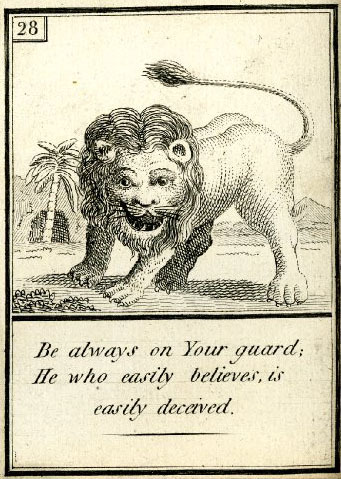 There are also numerous decks with Lenormand in their name that were created after 1846 and contain most of the standard Lenormand images but have additional cards such as a safe, a mirror, or lightning. 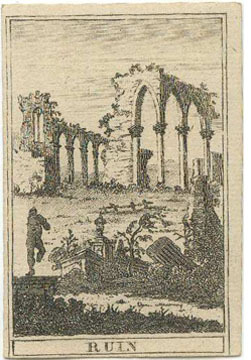 These are believed to be adaptions of the standard deck but I have found that some of the additional images can be traced to an earlier source. 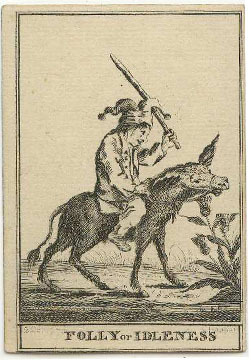 According to Decker, Depaulis, and Dummett, in 1972, Historian Detlef Hoffmann discovered that the German Le Normand is based on a deck published in Nuremberg as a game in 1799, and authored by Johann Kaspar Hechtle. The Game of Hope. 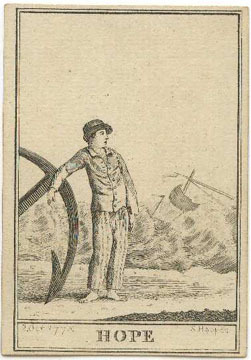 The numbering and subjects on the 36 cards in this deck are identical to the Petit Le Normand, but there are two miniature cards at the top of each card instead of one, one with French suits and one with German. 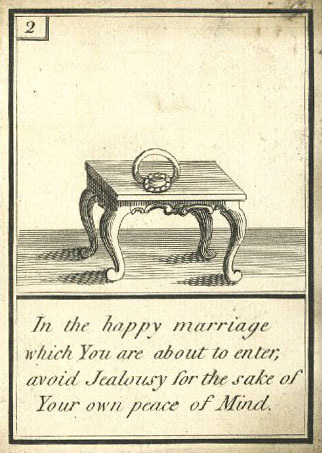 It was a race game and it came with instructions, which have been published in English by Katz and Goodwin. The 36 cards were to be arranged in a square of six rows of six cards, in numerical order and two dice were thrown to see how many cards along the square a player may move his or her marker. 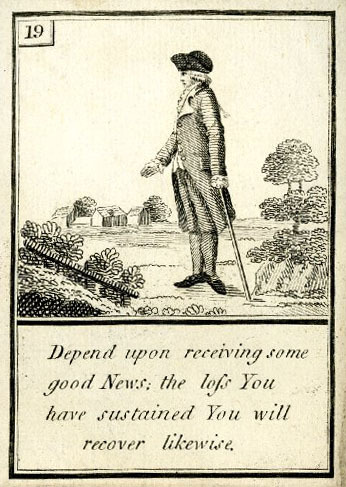 There are lucky and unlucky cards, and landing on them brings rewards or penalties. 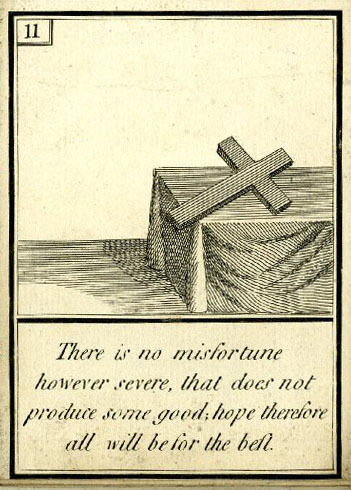 The first player to land on the next-to-last card, the Anchor (called Hope in the booklet), wins. 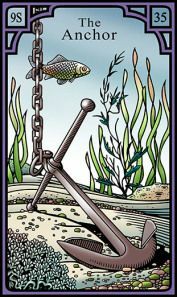 In Christian iconography, the anchor is the symbol of the Christian virtue hope and this explains the name of this card and of the game. If the player overshoots the anchor and lands on the last card, the Cross, he or she will be stuck until a double number is thrown or another player lands on it and the first player can go backward from this space. This type of game belongs to a group of spiral race games collectively known as The Royal Game of Goose. In all of these games the next-to-last space is the winning position. Goose games first appeared in Florence in the 16th century, where they were most likely brought from Greece. Their boards are in the form of a spiral and they may derive from Mehen, a 5,000 year old Egyptian game named after the snake god, who coiled around the sun god Ra to protect him. We have ancient spiraling Mehen boards carved from stone or bone but the game was thought to have died out before 2,000 bc. 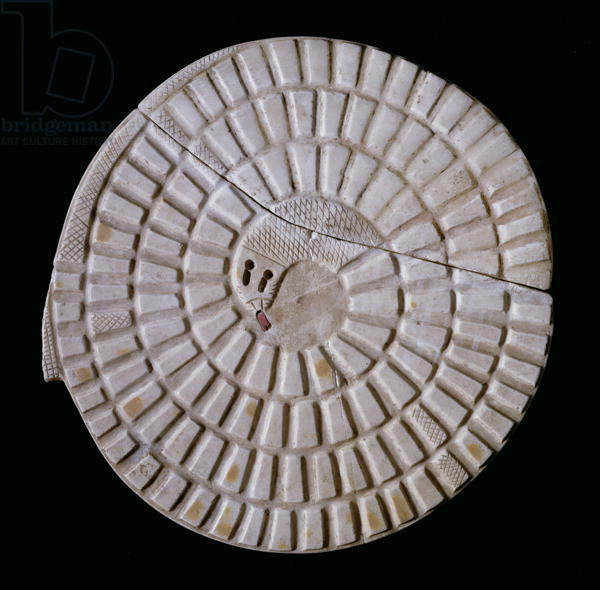 However, a similar looking clay artifact called the Phaistos disk, was created in Crete, circa 2,000 bc, There is no definite knowledge about the use of this spiraling disk but Rachel has theorized that it was a similar game board. Also, modern anthropologists have found a similar game being played in Africa in the 20th century. 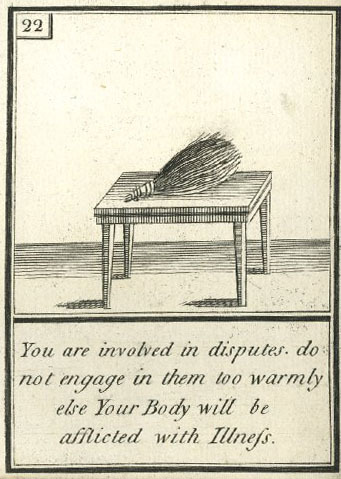 At the end of this Game of Hope pamphlet, there is a brief explanation of how the deck could also be used for divination. The deck is to be shuffled and the 36 cards laid out in four rows of eight cards and then a row of four on the bottom. 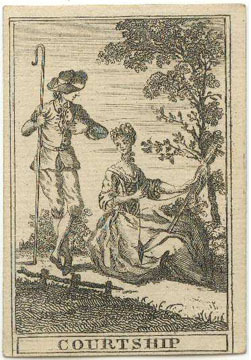 The position of a card representing the querent, called the significator, the Gentleman for a man and the Lady for a woman, determines how the cards are to be read, and the reader was encouraged to create a story centered on this character and the cards that surround him or her. 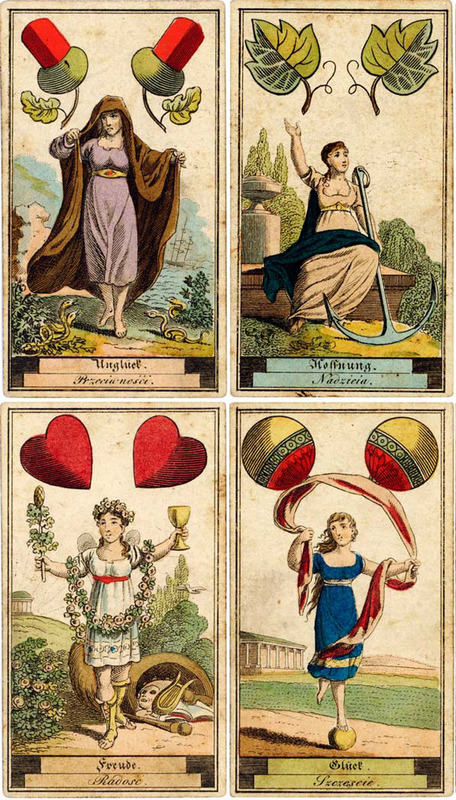 This is the standard Grand Tableau used by Lenormand readers today, but the 1799 pamphlet does not provided definite meanings for each card. Some cards, however, were considered positive or negative in the game and this would affect their interpretation. 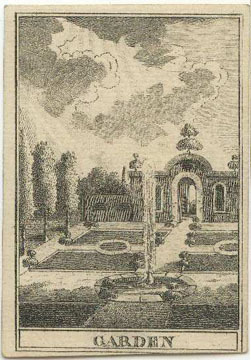 Also the Book is said to be a Grimoire, the Bird is from the Canary Islands, and the Path leads to the Garden. Recently, Tarot scholar Mary Greer was doing research in the British Museum’s archives when she found a deck of cards accompanied by a 31-page book that is an earlier model for the Petit Le Normand. 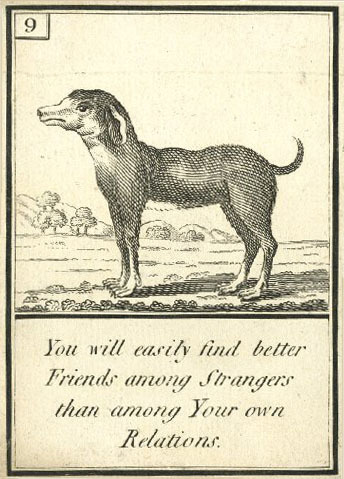 The deck, whose full title is Les Amusements des Allemands, or The Diversions of the Court of Vienna, in which the Mystery of Fortune-Telling from the Grounds of the Coffee-Cup is unravelled, and Three pleasant Games, viz. : 1. Fortune-telling from the Grounds of the Coffee-Cup. 2. Fortune-telling by laying out the cards. 3. 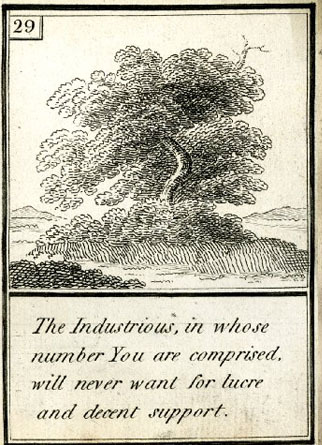 The new Imperial Game of numbers are invented, was published in England 1796. 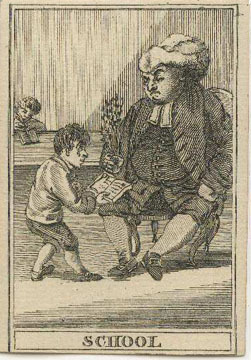 The book states that these cards were based on an Austro-German set of cards published in Vienna in 1794. 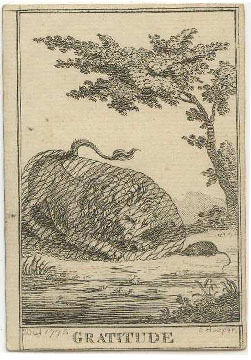 The cards consist of uncolored engravings with a full landscape on each card dominated by the singular subject. There are a few lines of text on the bottom of each card that are meant to be the divinatory meaning but also offer moral advice. There are only 32 cards in the deck, like a Piquet deck, four less than the Lenormand, they are numbered differently, and some cards, like the vipers card, do not relate to any Lenormand cards. The majority of the cards, however, can easily be matched with Lenormand cards. 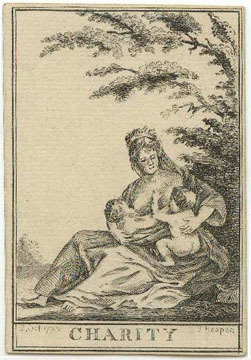 Below is a list of the cards with images provided by the British Museum. The images are used in accordance with the British Museum’s guidelines and are copyrighted to Trustees of the British Museum. They may not be used for commercial purposes without their permission. 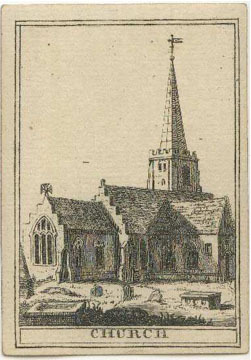 I have found that nearly all of these images and subjects, as well as the ones found in the Lenormand, can be traced to a deck created in England two decades earlier. There are no cards relating to the Lenormand Ship, Fox, Stork, Tower, Key, or Book (unless you consider the book that the child holds on the Child card). 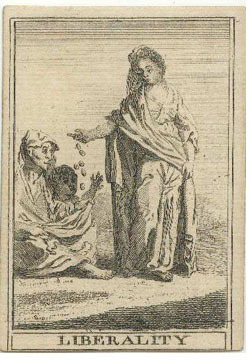 According to the book and the title, The Diversions of the Court of Vienna, (commonly known as the Coffee Ground Cards) were designed to correlate with numerology and divination with coffee grounds. Coffee grounds reading and tealeaf reading, together known as tasseography, were introduced in Europe in the 17th century with the importation of tea and coffee. Coffee ground reading is traditionally performed with Turkish coffee, and is more popular in Eastern Europe. To read coffee grounds, water is poured into a white cup on top of ground coffee beans, as is common when brewing Turkish coffee. The client may sip the coffee until sludge is left in the bottom of the cup. Then the reader places a saucer on top of the cup and turns it over so that the excess liquid pours out, leaving the grounds clustered on the bottom and sides of the cup. The remaining dark grounds form patterns and shapes against the white cup. The reader looks for images in the shapes, and notes their darkness, lightness, and position on the cup. When reading the grounds, each image and position adds meaning. Darker shapes are considered negative and light ones positive. The same shape positioned on the side or bottom will have a different meaning. There are hundreds of possible images the reader might envision in the blobs of coffee. Over time, lists of standard images emerged. One website that I investigated had a list of 120 meaningful shapes to look for. In that list 18 were animals or objects found on Lenormand cards. Because there is a similarity between these lists and the Lenormand images, it was natural to form a correlation between the two techniques, and that is what the Coffee Ground cards did. Also the fact that different positions change the meaning of an image is similar to what happens in a Lenormand reading. Because of this, some have suggested that the Lenormand images were derived from coffee readings, but these similarities do not prove that tasseography is the source. I believe that the source of the Lenormand is more likely found in cartomancy, which evolved from earlier forms of divination. The first cards in Europe were Islamic playing cards, known as the Mamluk deck, with four suits: coins, cups, scimitars, and polo sticks. They were introduced in Spain in the 14th century. 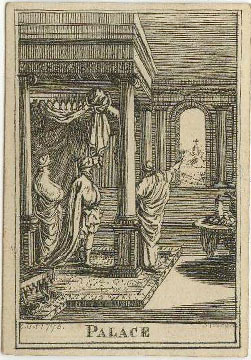 The Spanish and Italians copied the cards and created decks with the suits: coins, cups, swords, and staffs. Both decks have ten pips and three royals in each suit, equaling 52 cards (there are variations with four royals and 56 cards also with only nine pips per suit and 48 cards). 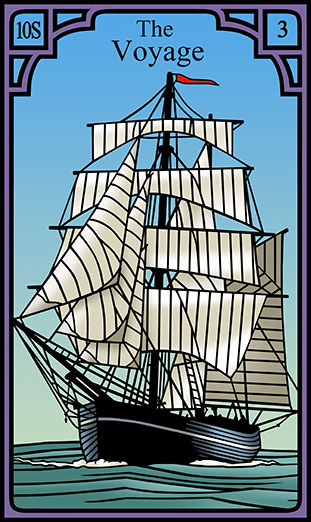 The decks spread through Europe, and although the essential structure remained, new suit symbols were invented in Switzerland, Germany, and France. Hand-painted and gilded examples of the Mamluk cards from the 15th century still exist and they contain calligraphic aphorisms, which suggest divinatory meanings that were attached to the cards. 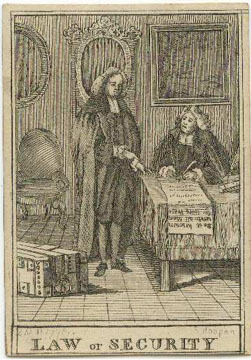 Historian Ross Caldwell has also discovered numerous Spanish references to divination with cards, in literature and in the records of the Inquisition. His work has shown that, at least in Spain, there have been professional card readers at work since the 16th century. It seems that from the beginning, cards were used for both gaming and divination. One of the first texts to describe divination with cards is the c.1450 Spanish Juego de Naypes (game of cards) by Fernando de la Torre, who dedicated his work to the Countess of Castañeda. Fernando described a game played with a 49-card deck of the four Spanish suits with nine pips and three all male court cards per suit. 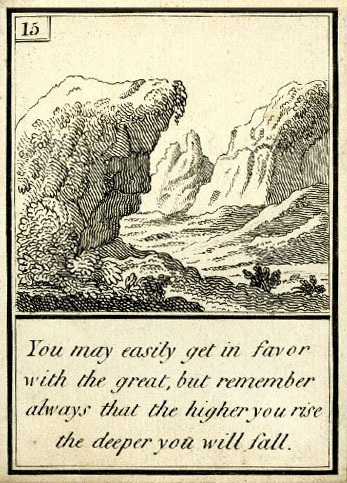 The deck also included an additional Emperador card, which functioned as a trump. 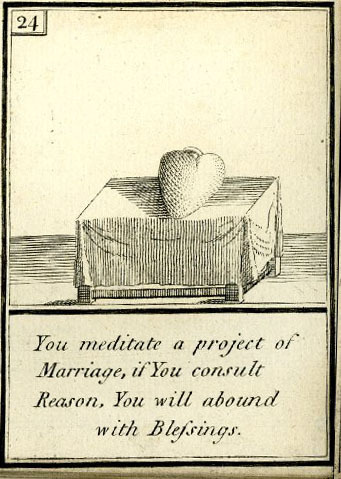 Fernando mentioned that the deck could also be used to tell fortunes, but only on the subject of love. 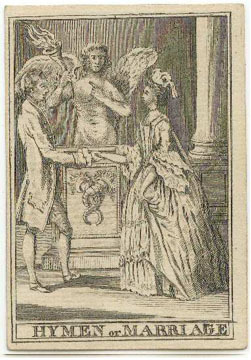 The cards could predict a man’s love interest with each suit representing a different class of women: coins represented maidens, cups wives, swords nuns, and staffs widows.in a different color for each suit and with the number of lines corresponding to the rank of the card: 20 lines for the Emperor, 12 for the Kings, and on down to one for the aces. 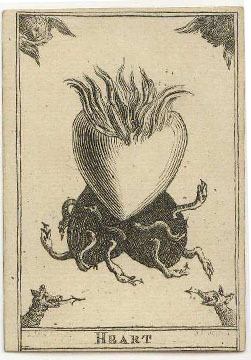 One of the first mentions of symbolism connected with an Italian Tarot deck, a deck containing an extra suit of trumps, is found in a poem attributed to Count Matteo Maria Boiardo, court poet of Ercole D’Este, of Ferrara. Boiardo wrote a poem about a set of Tarot cards, between 1460 and1494. 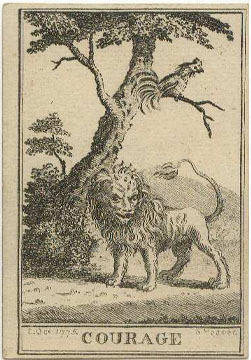 The deck he describes has four minor suits with 14 cards in each and a fifth trump suit with 22 cards, a Fool and 21 figures, which he calls “The Triumph of the Vain World.” This is one of the oldest references to a deck with 22 cards in the trump suit, but only images of the minor suits still exist. Boiardo’s minor suits are, eyes, vases, arrows, and whips, which in his poem symbolize four human passions: jealously for eyes, hope for vases, love for arrows, and fear for wips. 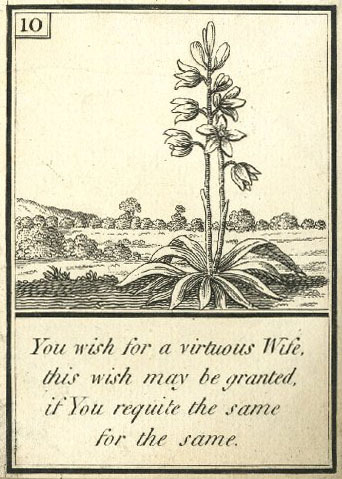 Each card contains a three-line poem at the top that can serve as its divinatory meaning. The Mainzer Kartenlosbuch is an oracle or fortune book, a type of divination book that was popular in the 16th century. In this tradition, the answer to the querent’s question is found in the book in the form of a poem, and the cards are only used as a means to arrive at the right poem. Some fortune books instead of using cards, made use of dice, the time of day, or a wheel to find the correct passage. Indeed, the earliest Mainzer Kartenlosbuch published in 1485, made use of a wheel and the divinatory poems were paired with pictures of birds or animals. One of the best examples of a fortune book is Le Sorti (the fates), written by Francesco Marcolini (c.1500-c.1559) and published in Venice in 1540. The Metropolitan Museum has a copy of this book and it is one of the items that we explore in my class at the museum. Le Sorti, is more serious in its philosophical purpose. It is heavily influenced by fortune-telling with dice but the book uses playing cards as its tool. Specifically, it makes uses of the king, knight, knave, 10, 9, 8, 7, 2, and ace from the suit of coins. Le Sorti lists 50 questions. 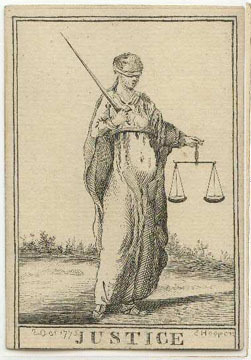 To find the answer to the chosen question, the querent draws two cards and finds the appropriate page where the two cards are correlated with an allegory on virtue or vice. Then, one card is drawn and the querent is redirected to a page on abstract principles. 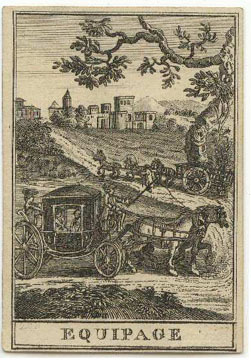 This page provides an additional card, illustrated on the page. 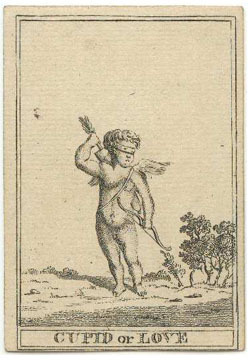 The card from the book is combined with another card, drawn from the deck, and these two lead to a page, headed by a philosopher, where the final answer is found, in the form of a three-line poem composed by the poet Lodovico Dolce (1508-1568). 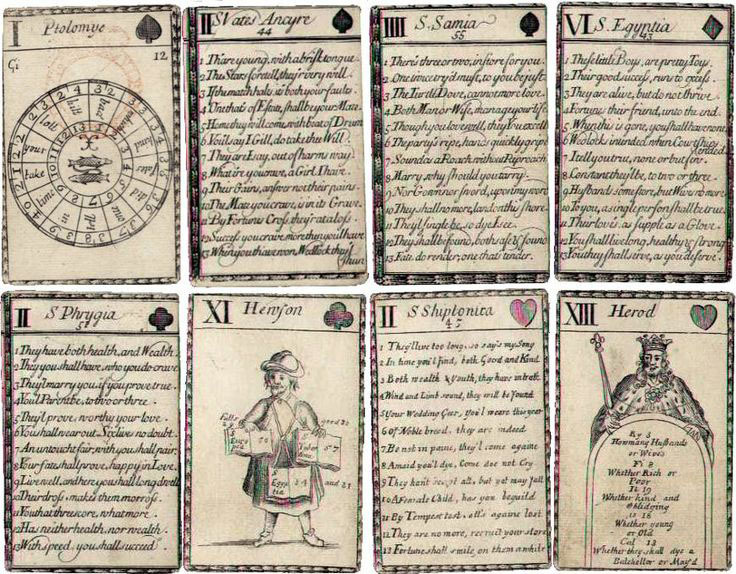 The oldest known deck of cards that was created primarily for divination is John Lenthall’s Fortune-Telling Cards, first published in England in 1665, with additional editions published up to 1712. The deck is structured like a 52-card deck with 10 pips and three royals in each suit but the kings contain a list of possible questions that the deck may answer and the answers are found on lists written on the even numbered pips. The odd pips contain wheels with astrological signs, numbers, and symbols, and the royals are equated to legendary mystics and magicians, with the queens and knaves holding books with numbers and singular words. The method of divination is often described as complicated or convoluted and not worth going into. 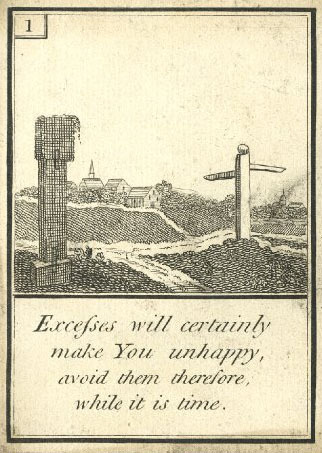 But as the questions and answers are found written on the cards, this is obviously a fortune book in the form of a deck. At this date, there seems to be no consistent meanings attached to individual cards except for individual decks that had the meaning written on the cards and their meanings were not transferred to other decks. 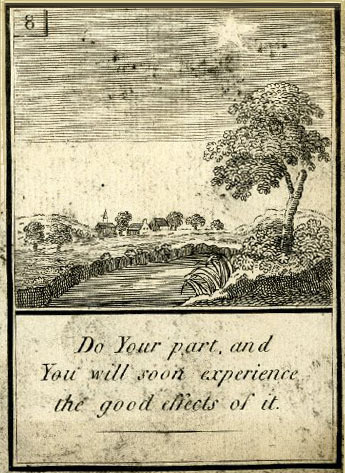 I again am thankful to Mary Greer for bringing to my attention an English fortune book published in 1729, Dr. Flamstead’s and Mr. Patridge’s New Fortune-Book containing . 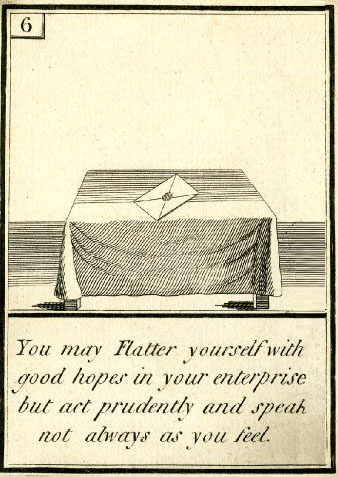 . . Their new-invented method of knowing one’s fortune by a pack of cards. 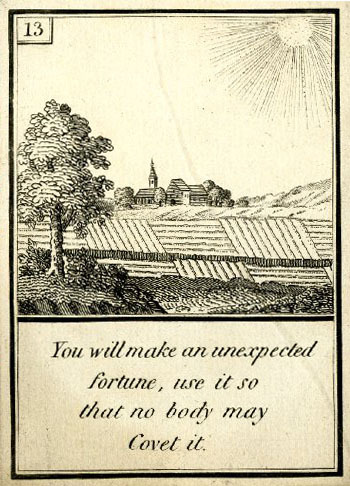 Like other fortune books, It contains a method of divination in which a chosen card led to a verse in the book. 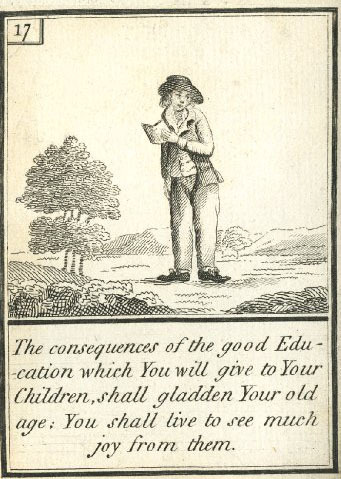 By 1770, however, a new shorter version appeared whose complete title is Patridge and Flamsted’s new and well Experienced Fortune Book, delivered to the world from the Astrologer’s Office in Greenwich Park, for the benefit of all young men, maids, wives, and widows. 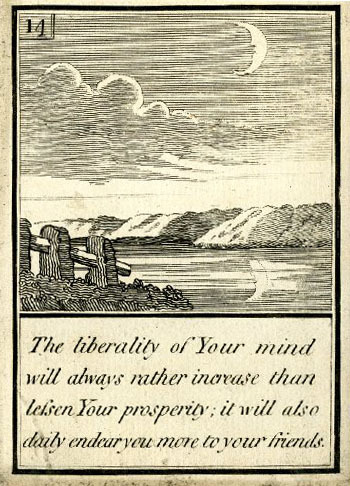 Who, by drawing Cards according to the direction of this Book, may know whether Life shall be long or short; whether they shall have the person desired; and every lawful question whatsoever. 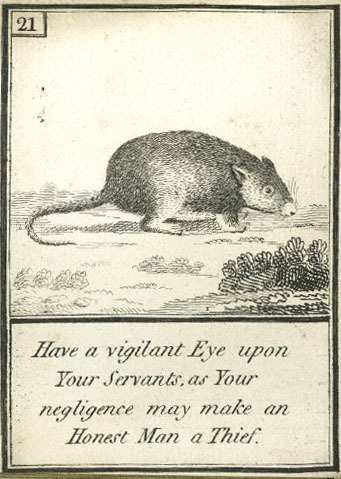 The signification of Moles in any part of the body; and the interpretation of Dreams, as they relate to good or bad fortune. This book provided a definite meaning for each card in a standard deck and it could be applied to any deck. With this universal system we have the beginning of what is considered true cartomancy, in which any card deck can be used for divination without a list of specific questions and lists of answers. The reader is free to answer any question and the list of answers is only limited by the reader’s imagination. 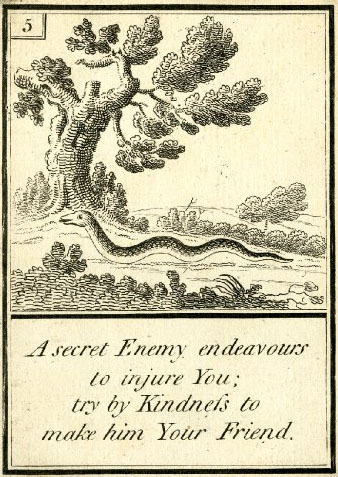 Historian Ross Caldwell tells us that there is further literary evidence found in the play Jack the Gyant-Killer, from 1730, that attests to the practice cartomancy in England in the early 18th century. 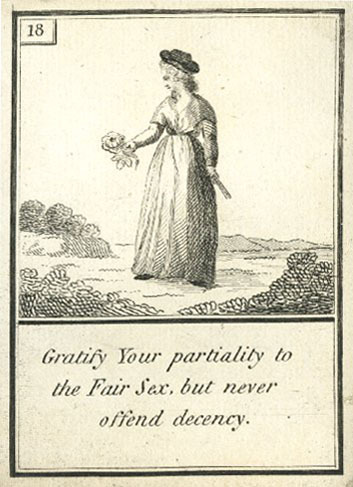 In this same period, a new category called morality cards was born. 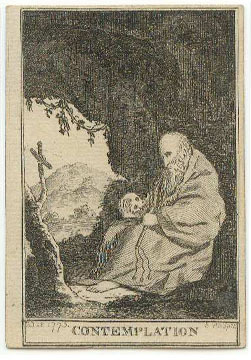 One example is Geistliche Karten (clergyman cards), published in Germany in 1718. This was a deck with moral a homily written on each card. 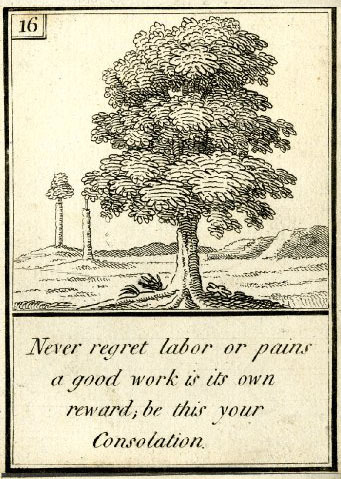 The intent was that one card should be drawn each day as the motto for the day. 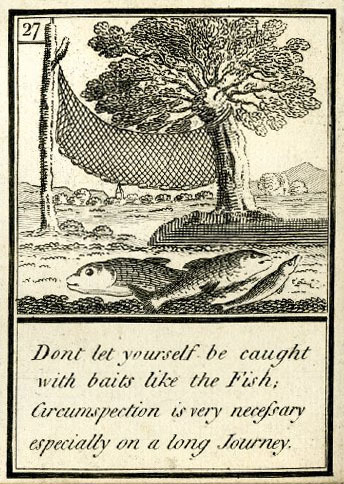 This practice was combined with playing cards by adding a motto to a standard card and In England, numerous engraved decks were published in the early 18th century. 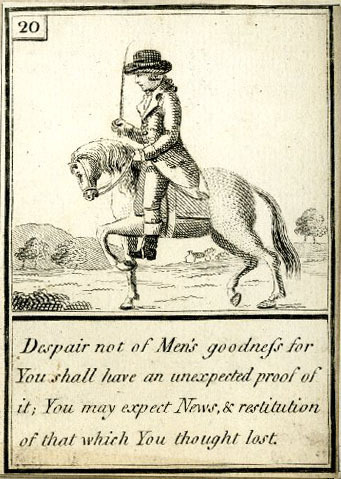 Although they all maintained a connection to the suits and structure of standard playing cards by adding a miniature card or at least the suit symbol and number at the top, the cards were dominated by illustrative scenes and contained a moral message at the bottom. 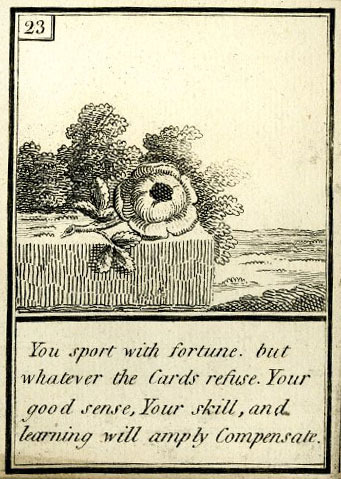 Examples include The Duke of Marlborough’s victories Playing Cards from 1707, Lenthal’sl Proverb Playing Cards published between 1710 and 1720, and Hogarth’s Delightful Playing Cards form 1723 (based on the moralistic artwork of William Hogarth). 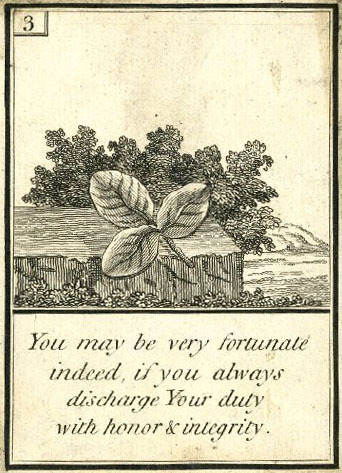 The Coffee Ground cards, with a moralistic message on each card, actually fit this category (although they do not reference playing cards) and demonstrate the ease in which morality cards could be adapted to divination. 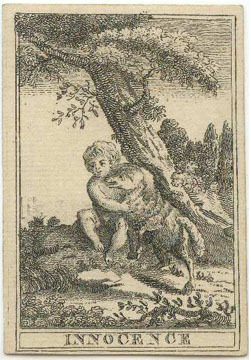 The Game of Hope itself is similarly moralistic, in that virtues and vices are suggested in its symbols, but it is also an oracle deck. Now that cartomancy had been born and merged with moral statements and pictures, the stage was set for the development of oracle cards, in which each card is an illustrated symbol designed for divinatory interpretation. 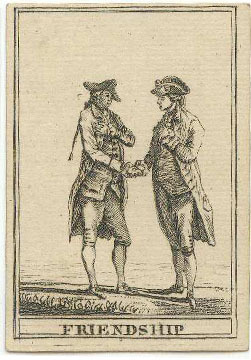 The oldest oracle deck that I have found, the one that appears to be the predecessor of all Lenormand decks and other oracle decks, Including The Burning Serpent Oracle, is S. Hooper’s Conversational Cards, published in England on October 2, 1775. 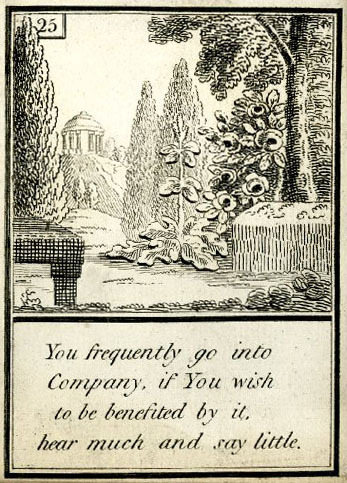 Cards from this deck can be found in The Waddington Collection and in the British Museum collection and are available on line, but with very little information provided. In the few comments on the deck that exist online, they are also referred to as the Tragedy and Comedy Cards, because Tragedy and Comedy is written at the bottom of what may be the title card. 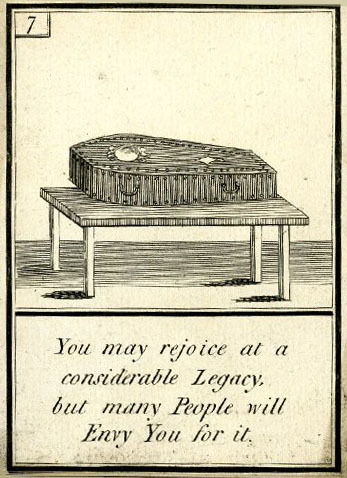 The deck consists of 56 uncolored engravings each with a morally descriptive picture but no text other than the title. When I first found these cards on the Internet, all that was said about them was that they were an antique fortunetelling deck available for use in craft projects. I immediately noticed that the figures were heavily influenced by the art of Hogarth and Joshua Reynolds and suspected that they were created in the mid 18th century, earlier than any other oracle cards. 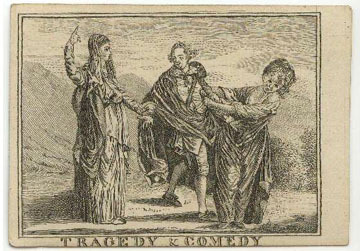 In fact, the scene depicted on the title card is drawn form a painting by Joshua Reynolds depicting the actor David Garrick standing between two allegorical women, one representing tragedy and one comedy. 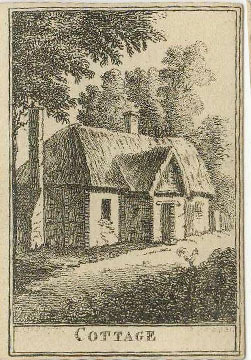 This painting was painted in 1761. So I knew the deck had to have been created after that date, but how long after was the question. 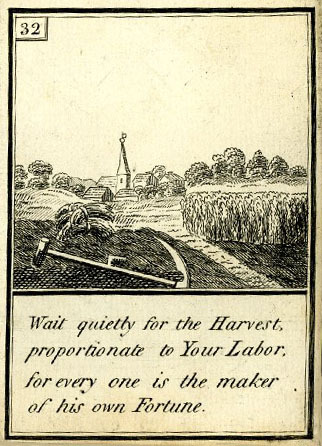 It was only when I found a faint trace of a name and date on the bottom of one of the cards, that I learned that it was published by Hooper in 1775. This information allowed me to better research the deck and to find clearer copies. I even discovered that it had three additional cards that I did not know of at first. The reason that they were called conversational cards is that they were designed for playing a game in which the first card picked became the beginning of a story. Each player then picked an additional card and used it as inspiration to continue the tale. This is something like the game invented by Surrealist artists, called “The Exquisite Corpse.” The Hooper cards are the oldest deck I have seen that has a male and a female significator and these cards suggest that they could become the central figures in the story told with the cards. 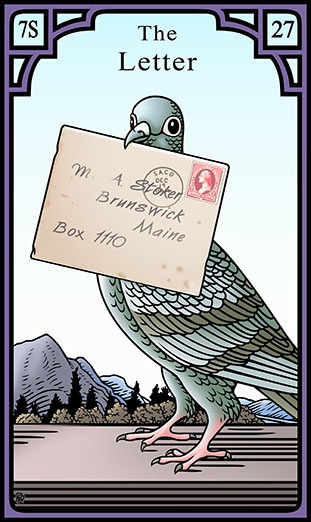 Rachel suggests that the significator could represent the person who started the story by picking the first card. With the significator as the focus of the story we can see that this game is similar to The Game of Hope’s prescribed method of divination. 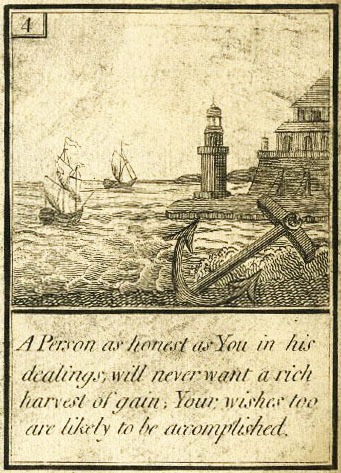 The Hooper deck is the oldest one to have a figure with an anchor representing Hope; it has a melancholy hermit contemplating death and the cross; and it has an optimistic figure of Fortune like most non-Lenormand oracle decks and unlike the Tarot with its moralistic Wheel. 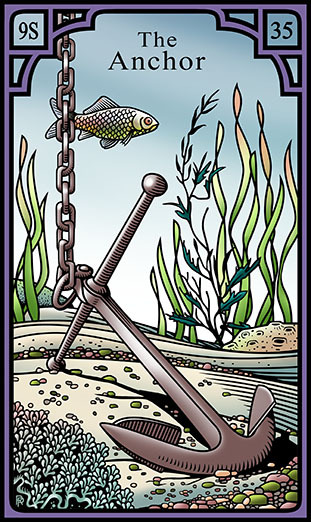 The complex stories depicted on the cards often help to explain the meaning attached to a single object on the related Lenormand card. The images are rich with cultural references going back to Elizabethan England and to the Classical world and I have spent months attempting to uncover the stories connected with each card. Here is a list of the Burning Serpent cards with a correlation to Lenormand cards and the Hooper cards. Some Hooper cards are applicable to more than one Lenormand and sometimes two cards are applicable to one Lenormand. The correlations are determined by the meanings as much as by the image. I believe that the Hooper Cards are one of the earliest, if not the earliest oracle deck. Oracle decks are not a variation on the Lenormand deck but the larger group to which Lenormand belongs. 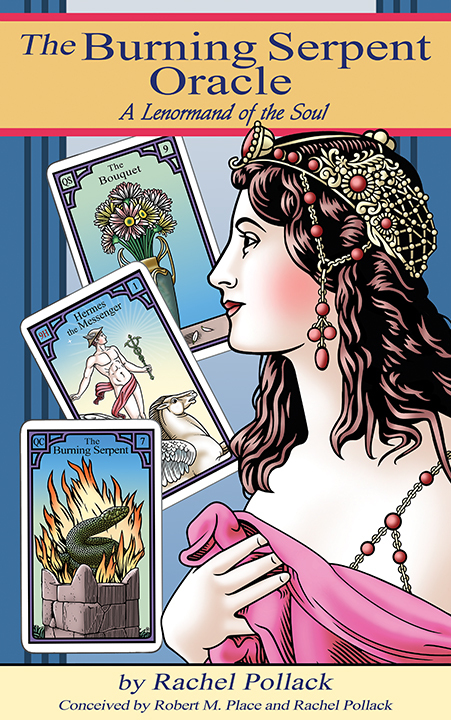 The Lenormand is an oracle deck and the earliest oracle cards contained moral allegories and references to divine figures. By creating the The Burning Serpent Oracle Rachel and I were attempting to add these aspects to the Lenormand cards and in effect we were reconnecting it with its roots. Here is a video that Marcus Katz, of the Tarosophy Tarot Association, made when he first opened his copy of The Burning Serpent Oracle. He is demonstrating how to allow a new deck to introduce itself. I like readings that have ongoing conversations with the deck. I do something with Tarot I call “roll your own” readings, where you begin with one question, and then let the particular card that comes up suggest the next question, and keep doing this until you come to a good resting place with the issue. Here, because the individual cards go back into the deck, you can see a theme develop when cards come up more than once. This is not a traditional Lenormand approach, of course, but because each cut involves two cards, it allows for that sense that two is the most basic unit. This is something I’ve begun to bring into tarot, in what I call “reading Tarot Lenormand-style.” While there are many people in both traditions who have no interest in mingling the two, I suspect that such influences will become more common as people get beyond the first–and very necessary–stage of keeping them very distinct from each other. It’s fascinating that when he asks the first question, something like “What is the alchemy of the deck?” (sorry if I’ve gotten it a bit wrong) he gets the Key, which might be said to be the most occult card in the deck. But what does the Key unlock? The Man, which is to say, Marcus himself, since for a male querent, the Man is the significator. But Marcus is not really asking this just for himself, he wants to know the deck’s intentions in the world. Thus the subject card can stand for “everyman,” and the deck can be saying, the primary thing we unlock is ourselves. To order The Burning Serpent Oracle go to the order page. As we come to the end of a very fraught process of getting the Burning Serpent Oracle actually in hand to send to people, we wanted to offer an apology and explanation to all of you who have been waiting so patiently for it to arrive. Someone pointed out to me that we’ve been passing through a Mercury retrograde period, during which communications often get confused or blocked. The Greek name for Mercury, of course, is Hermes, and as most of you know, the first card in the deck is Hermes The Messenger (Hermes is also the name of Robert’s publishing company). 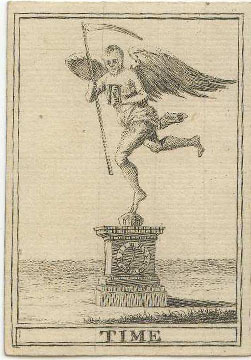 In the picture he comes riding on a winged horse from left to right, as if entering the physical world of the cards from the spiritual world that is the home of all divination. In traditional Lenormand decks card 1 is The Rider, and means messages, things brought, possibly from far away. 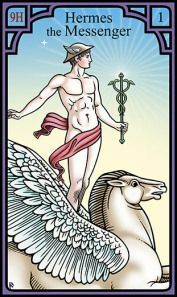 This indeed is what Hermes The Messenger means, and the card came up, along with the Voyage, in a reading several weeks ago to indicate that the decks were on the way. Here is what happened. The books arrived several weeks ago, and all we needed were the cards to be able to send out all the pre-orders. But the cards took longer, and were more complicated, so we had to wait. They were printed in Europe, and the German publisher Urania bought a number of copies to sell on their own website, while our copies were put on the boat to be sent here. As a result, a number of people bought copies from the German site, getting them before we did. However—these did not include the book, since Urania is only selling the deck. Meanwhile, the decks finally arrived in New York harbor. And then Hermes Retrograde truly worked its maddening, negative magic. The packing had the wrong papers. They were almost the right papers, but not quite. Days of tense conversation ensued, between us, the New York Customs office, and the European printers. Meanwhile, the decks were sitting in storage in New Jersey, close but locked away. Finally, we all worked out what needed to be done. The printers expressed the correct papers overnight from Europe, Robert signed them and express mailed them (with 15 minutes to spare at the post office) to the customs officials—and then it was July 4th weekend! The good news is that we know they received them, and we are hopeful the decks will finally get on a truck Monday, July 7. To speed things along as best we could Robert and I have addressed the mailing labels for the Priority Mail boxes, so that as soon as we have the decks in hand we can combine them with the books and send them right out. We apologize for all these terrible delays, and wish to express our great gratitude for everyone’s patience. If any of you have felt frustrated that the Burning Serpent has not arrived, believe me, it’s nothing like what we’ve been feeling! Pretty soon now, we will have them in hand, and send them out as quickly as possible. Thank you. Our Indiegogo Campaign to fund the printing of The Burning Serpent Oracle has now ended and it was a huge success. We are now accepting preorders through this website. To order go to the How to Order page.